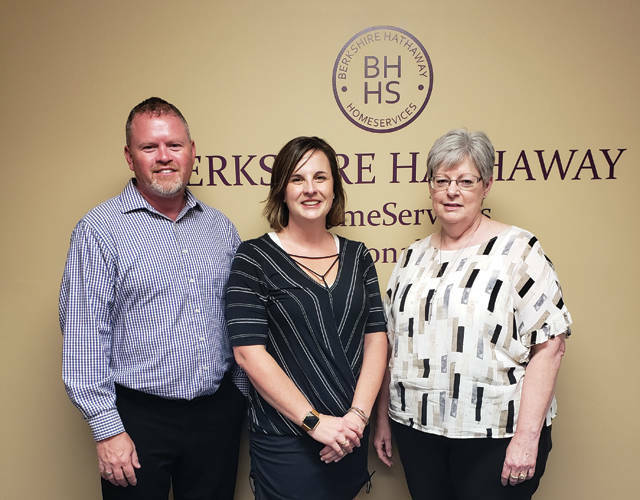 Darke County Center for the Arts Barbecue and Blues sponsors Merry Lee Cross and Shaun Hayes of BHHS Pro Realty are pictured with DCCA Executive Director Andrea Jordan. GREENVILLE – Darke County Center for the Arts recognized Merry Lee Cross and Shaun Hayes of BHHS Pro Realty for their sponsorship of the annual fun-filled fundraiser “Barbecue and Blues,” set for July 13 on the lawn at the Greenville Public Library, 520 Sycamore St.
Gates for Barbecue and Blues will open at 6 p.m. Music will be provided by the Doug Hart Band and special guest Austin “Walkin’ Cane,” playing from 6:30-10:30 p.m. Featured barbecue food vendors include Main Street Greenville businesses The Coffee Pot, Merchant House and Romer’s Catering, and local food truck favorites Kona Ice and Nacho Pig; wine will be for sale as well as micro brews from Moeller Brew Barn. According to DCCA Artistic Director Keith Rawlins, Doug Hart and his band blend the blues with rock to create a passionate, soulful sound. “Doug has earned several awards in Blues Challenges around the region; his dynamic, energetic style will really get our Barbecue and Blues crowd jumping,” Rawlins said. Rawlins also said special guest Austin “Walkin’ Cane” has won quite a local following due to several previous performances for DCCA. “This Clevelander sounds like an early blues singer from the Delta; his story-telling abilities pull audiences in and his smooth baritone keeps them listening and leaves them begging for more,” Rawlins said. Additional sponsors of the event include Matt and Angie Arnold, George and Becky Luce, and Matt and Mindy Steyer. The event venue is provided by Greenville Public Library; other sponsors are Erwin Brothers, Rumpke, and the John R. and Miriam H. Knick Fund. Proceeds from “Barbecue and Blues” support DCCA programming, helping make possible DCCA’s Arts In Education program as well as the Family Theatre Series and a summer theatre residency by Missoula Children’s Theatre. Tickets for the event are $10 for adults and $5 for children 12 and younger; food and drink are not included in the ticket price. A limited number of reserved tables are available for purchase. In case of inclement weather, “Barbecue and Blues” will move inside Henry St. Clair Memorial Hall. Although tickets will be available at the gate, DCCA strongly recommends purchasing them in advance. Tickets and tables can be purchased by contacting the DCCA office at 937-547-0908. Tickets also are on sale at Greenville Public Library, Readmore’s Hallmark and Darke County Welcome Center. Darke County Center for the Arts presents and promotes performing and fine arts encouraging cultural enrichment. For more information about “Barbecue and Blues,” or DCCA’s upcoming 2018-19 season, contact the DCCA office at 937-547-0908.